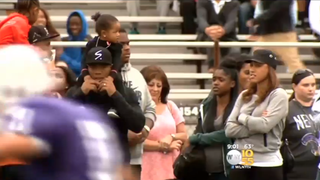 Ray Rice and his family attend opening football game Saturday at his alma mater, New Rochelle High School. Ray Rice and his family made their first public appearance Saturday after a video was released last week of the Baltimore Ravens Star striking his then-fiancé in a hotel elevator in Atlantic City, N.J. last February, The Journal News reports. Rice, who was suspended from the Ravens and banned indefinitely from the NFL after the video surfaced, was the focus of a swarm of media attention when he attended the opening football game at New Rochelle High School, his alma mater. The team won 34-6 over Ramapo High School, the report says. The beleaguered star and his wife, Janay Palmer-Rice and their daughter attended the game even after the school on decided Wednesday to remove Rice's plaque from its Wall of Fame and take down his No. 27 Ravens jersey from the gymnasium. His retired No. 5 jersey from high school remains on display, the report says. New Rochelle High School principal Reginald Richardson told the news site that he was not surprised to see Rice at the game. "This whole situation opened a national conversation, of course, and we're at the center of it, being that this is his home," he said. New Rochelle football coach Lou DiRienzo, who coached Rice and has remained close with him, voiced strong support for the athlete. He told The News Journal that he went to Baltimore, Md., to see Rice after the video was released. When The News Journal asked about the message Rice's presence sends to his team, DiRienzo said: "Twenty seconds, or 30 seconds, of a bad decision has affected this young man's life forever, and they need to think before they act. So I think my kids are getting great lessons in terms of making a mistake, admitting it, not repeating it, and learning from it. What better lesson to learn from an NFL superstar."